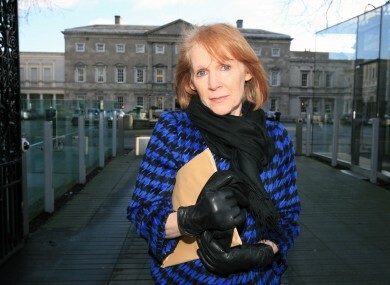 The former MEP Kathy Sinnott has been criticised by a Fine Gael TD for her opposition to the children’s referendum but Sinnott has hit back saying that Jim Daly has not done his homework. FINE GAEL TD Jim Daly has said that comments by former MEP Kathy Sinnott in relation to the children’s referendum are disingenuous and has accused her of engaging in “hysterical hyperbole”. He was speaking following claims by Sinnott that if the referendum is passed in November it will “lock in” the UN Convention on the Rights of the Child (UNCRC) to the Irish Constitution. However, Sinnott stood by this claim saying that it is “absolutely true” and accused Daly of having not “done his homework” on the proposed amendment which proposes to enshrine the rights of the child in the Constitution. “He is absolutely wrong,” she told TheJournal.ie. In a statement yesterday the Cork South West deputy said that there is “absolutely no reference either implicit or explicit” to the UNCRC in the wording of the proposed amendment to the Constitution. He said: “I have challenged Ms Sinnott to engage in a more honest debate on the upcoming referendum without resorting to hysterical hyperbole which is unrelated to the substance of this debate. “Kathy Sinnott is introducing false and misleading arguments which are clearly not involved in this referendum. The public deserve to have the facts of the matter presented to them in the debate over the Children’s Referendum. “What this Referendum will do is recognise children’s rights individually and provide them with certain protections from the State,” he insisted. But Sinnott, who is advocating a No vote on 10 November, said that passing the amendment would ratify the UNCRC and with it would mean that unelected officials at the EU and the UN would be allowed to rewrite Irish law. “The lead principle of it (the UNCRC) is the best interests of the child be determined by the State,” she said. “In the natural order, the parents decide the best interests of the child”. Sinnott also said that there were a “huge amount of people waking up” to the dangers of the proposed amendment. Email “Sinnott accused of engaging in 'hysterical hyperbole' over referendum”. Feedback on “Sinnott accused of engaging in 'hysterical hyperbole' over referendum”.